The Economist GMAT Tutor (7 day free trial available) is one of the most exciting new options for GMAT prep that I’ve found this year. It’s a full length, online, interactive course for the exam. The unique feature of the course is that it requires active learning: while proceeding through the material, the student must answer questions every few seconds in order to move forward. 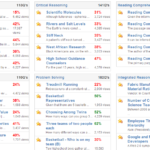 There are, of course, many good options for online GMAT prep, but nearly all of them are straight video courses. As far as I know, The Economist’s program is unique in that it’s both interactive and adaptive. I’ve been using the program for the past week, and I recommend it highly. In this review, I’ll go through the features of the program, what I like about it, and what could be improved. The Program: The Economist GMAT Tutor course is taken through your web browser. For each session, you select how long you want to study (between 5 and 60 minutes). The program will adapt to provide you with a solid lesson for that time frame. Once in the lesson, it displays a short paragraph of material and then requires you to take an action. You may just have to click “Continue” or “Yes, I understand”, or you may have to answer a question. The program proceeds until you’ve studied for the amount of time you selected at the beginning. Overall, the course is supposed to take 80-120 hours to complete. It starts out with the fundamentals of quant and verbal and gradually builds to more advanced concepts and problem solving techniques. Basically, it could take between 2 weeks and 3 months to finish, depending on how much time you spend per week. You can’t skip ahead to later material – the course it set up to cover all relevant GMAT topics. 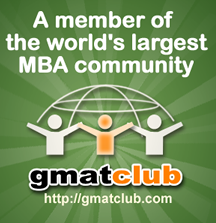 This makes it an excellent option for people just beginning their GMAT prep. However, it’s also a good option for people in the middle of their prep. Even though I’m an experienced GMAT instructor, I learned a couple of new tips and strategies during the initial study sessions. So I think a GMAT student at any level could benefit from this program. I should say that one reason they can’t let you skip ahead is that they have an excellent score guarantee (50 or 70 point improvement). So, they have to be sure you covered all the material. Advantages: The biggest advantage of The Economist GMAT Tutor program is that it requires you to stay actively involved in the learning process. Since you have to continuously answer questions and receive feedback, you are required to stay engaged and alert. In contrast, a straight video lesson program can be hard to pay continuous attention to. The Economist course is also adaptive, which means that it will proceed through the material faster if you get questions right, and slower if you get questions wrong. It has questions at all levels of difficulty, and I believe it asks more challenging questions if you’re doing well – just like the actual GMAT! Instructor Support: Another cool feature is that you can click a button to email an instructor. For any concept or problem you don’t understand, you click on a little bubble icon and type in your question. I’ve done it several times and received a detailed response within a day or so. I’ve been particularly impressed with the caliber of the staff – one of my questions was answered by Dr. Ilana Goldberg, who has been developing high-level GMAT teaching material for many years. On her beatthegmat profile, it says that Dr. Goldberg helped write the “pedagogic paths of the GMAT Tutor learning program”, which means she contributed to the adaptive algorithm. Practice Exam: I took a full-length exam from the Economist and thought the questions were realistic, closely comparable to the actual GMAT, and sufficiently challenging for someone aspiring to a 700+ level score. The review options and explanations after the exam ended were excellent. I scored 740 on the exam (Q50, V43). I thought the verbal section was incredibly difficult, particularly one long Reading Comprehension science passage. 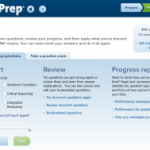 Score Improvement Guarantee: The Economist program offers either a 50-point or 70-point score improvement guarantee, depending on whether you choose the “Complete Prep” or the “Premium Prep” package. To be eligible, you are required to complete at least 90% of the course and fulfill some other conditions. Cost: If you buy through this link, the cost is $750. You will initially receive a 7-day free trial and can upgrade to full access at any time. Overall, I highly recommend The Economist GMAT Tutor and consider it an excellent option for a full length online GMAT prep course.